A fury of blue, gold, maroon, black and red colors filled Haas Pavilion on Saturday evening. Gymnasts from No. 2 Stanford, No. 7 Nebraska, No. 8 Cal and No. 14 Arizona State warmed up in different ways — some sitting on the bleachers to get into the zone, some chanting their team’s names and others focusing solely on practicing their first apparatus. Despite how the gymnasts chose to prepare for the meet, the competition results were as expected, with the four teams placing in order of their current rankings and Cal finishing in third. 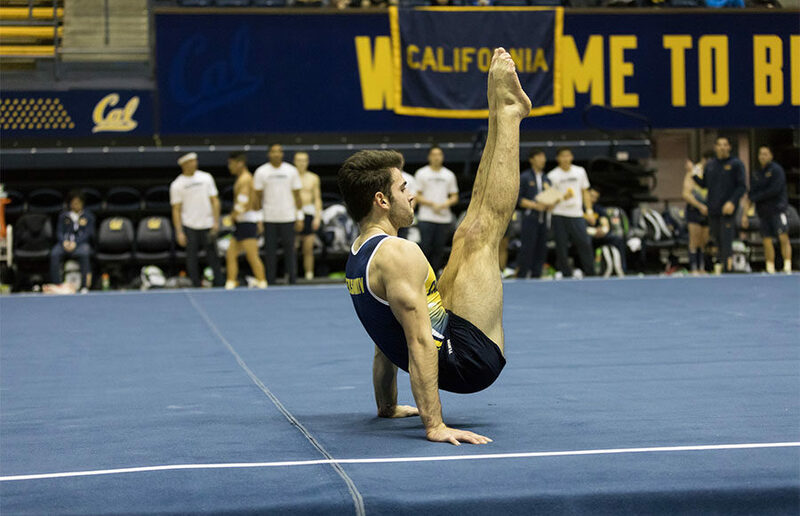 The meet started with Cal redshirt junior Michael Rauchwerger on one corner, who started the floor exercise off with a solid score of 14.000. At the other end of the Pavilion, Cardinal junior Jacob Barrus started off with an equally solid score of 14.100 on the parallel bars. While ASU quietly observed its gymnasts compete on the pommel horse, Nebraska’s swung effortlessly on the high bar, with teammates cheering loudly and high-fiving each other after each of the Huskers dismounted the apparatus. Something about the Bears’ demeanor was different Saturday, and their energy showed on the floor exercise. Senior Nicholas del Junco pumped his fists in the air and embraced his teammates after a solid performance that earned him a 14.250. Sophomore Aaron Mah succeeded del Junco’s act with similar emotions after his performance, finishing with an even stronger score of 14.700. Things were looking good for the Bears. Their strength on the vault was also underscored later in the evening, when they earned a 70.800 and subsequently had the highest team aggregate score in the event. In the meantime, the Cardinal struggled on the high bar, with two athletes — including freshman David Jessen — falling off of the high bar before their dismount. Senior Akash Modi was the center of attention, however, as the entire stadium looked on as the U.S. Rio Olympics alternative landed his way to a nation-high score of 15.050. For the ASU gymnasts, the still rings proved to be a challenge. Many of Arizona’s gymnasts struggled to keep the rings still — one of the keys to success in the event — and it showed in the men’s scores. The highest score for the Sun Devils on the rings was mediocre, with senior Jared Newman earning a 13.000. The Bears’ pommel horse difficulties plagued them once again, with sophomore Bailey Chang scoring a 12.150 and junior Yordan Aleksandrov uncharacteristically scoring a 10.700. Senior Adam Young, however, seemed to turn the event around for the Bears, doing a handstand and moving across the pommel horse. Young, the rest of the Bears and Cal head coach Brett McClure all burst into cheers after the performance, but he ultimately finished with a 12.800. Cal, which has lost four of its last five competitions, barely missed out on second place, with Nebraska beating them out by just more than four points, 404.050-408.800. 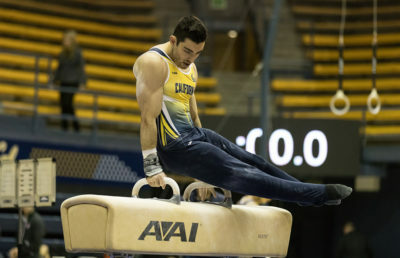 The pommel horse, an area of struggle for the Bears, could be a decisive event moving forward in the season. If the Bears work especially hard on the event during practice, perhaps that could be the turning point that is desperately needed for the Bears to win their upcoming competitions.